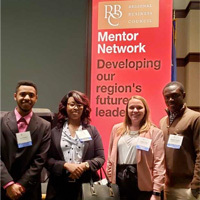 Webster University students representing various majors in the Walker School of Business and Technology participated in the Regional Business Council Mentor Network Spring Culminating Reception on April 9 at the Boeing headquarters. During a panel discussion, business executives from local organizations shared stories about their college and career experiences and offered career advice to the many college students present. 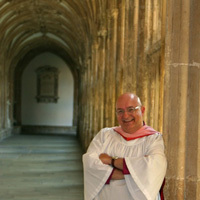 Department of Music chair Jeffrey Carter is singing and leading his own choral music at two cathedrals in England; Orlando CRC Deborah Straubinger has been elected as president of the board of directors for the Central Florida Higher Education Alliance (CFHEA); Career Development's Marcie Schumert and Rebecca Nelson received awards from the Missouri Career Development Association (MoCDA); librarians Heidi Vix and Eileen Condon presented “Data-Driven Collection Review” at the MOBIUS, Psychology professor Linda Woolf will give the keynote address at the fifth annual Stanford Psychology One Conference July 14-15.